Released across a variety of platforms by budget kings Codemasters, 4 Soccer Simulators unsurprisingly includes four different variations of football, with each alternate version of the game having its own set of rules. 11-a-side is played on grass and represents regular football. Indoor Soccer is enjoyed on laminate flooring, and has smaller goals with no corners or throw-ins – the ball simply bounces back into play. Soccer Skills replicates a typical training session, with options for dribbling and shooting practice. And finally Street Soccer takes the beautiful game to the grimy inner city pavements. On the surface all this makes the overall product appear quite good value. However, just like Millwall, the problem comes when you actually try to play football. Due to their inherent rubbishness all the games play identically. Whether in possession or not, the footballers all run like Jan Molby and tackle like a raging Scholes (slow and out of control). In addition the ball stays glued to the players boot, allowing for miraculous on the spot turns. This makes passing utterly pointless and ensures each game degenerates into a series of end-to-end John Barnes style miracle dribbles and tap-ins. So at this point, dear beleaguered reader, you would be forgiven for wondering why I have made a specific point of bringing this game to your attention? Well, have you ever curled a ball round some dustbins, between two garages and over a parked Ford Cortina? I have! 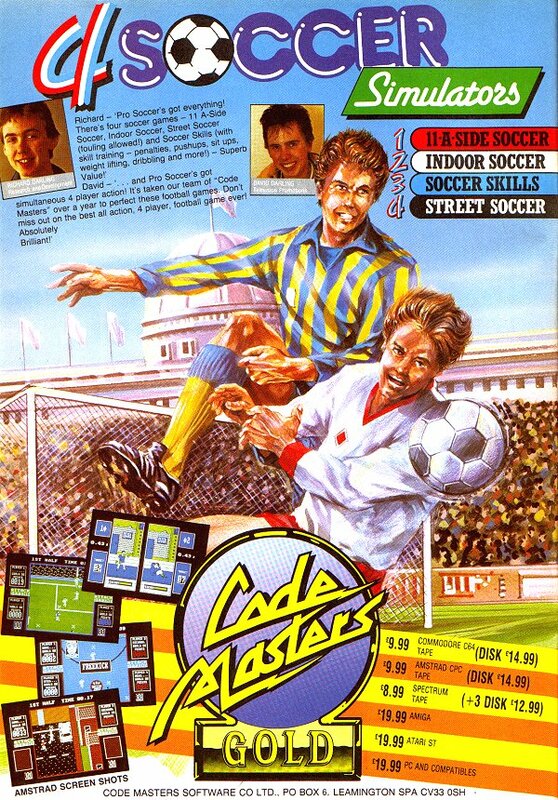 Street Soccer, the only ray of light in Codemasters near disaster of a game, is without doubt the most realistic simulation of kids mucking about ever created. Simply put, it is bloody awesome! Street Soccer takes place in a cul-de-sac, round the back of the houses. The pitch is littered with garages and parked cars to avoid, the goals are scratched onto walls with chalk and there is no referee to be seen. With no consideration for formation or tactics all the kids chase the ball like they’re playing for Northwich Victoria. If you choose to fly in with the ‘reducer tackle’, no worries, it’s all fair game. Losing 5-0 and had enough? Just punt the ball into some trees and see the game abandoned! The keepers are also completely pathetic, replicating the fact that Tunnel Vision Timmy always got picked last and was made to go in goal. The sense of realism is astounding! Street Soccer is the computer game equivalent of Jimmy Hill’s chin – hilarious yet beautiful. At this point it would be easy to conclude that 4 Soccer Simulators is less than a game of two halves, resulting in a 3-1 win to the bad games. But that would do it a grave disservice. Whereas 11-a-side, Indoor and Skills are all a steaming pile of Hotspur, Street Soccer still has one last David Fairclough on the bench. In a game of Street Soccer it is possible, although not easy, to lose the ball down a manhole. At this point all the players start arguing (via speech bubbles) and the dispute quickly spirals into petty squabbling until the kids eventually go home for tea, abruptly ending the game. Upon first discovery, this amusing incident is a revelation and every subsequent game then descends into a manhole hunt. The quest for lost ball brilliance and childhood innocence! I urge you all to give 4 Soccer Simulators a punt. It may contain three terrible interpretations of the greatest sport on earth, but it also brings you the best and most realistic computer football game ever made! You can keep your FIFA and your Pro Evo, Street Soccer is King and I care not if you choose to object, because it’s my ball and I’m going home! We would like to apologise to any Millwall, and Northwich Victoria (though not Tottenham) fans that are offended by Peter’s comments. If it’s any consolation, Peter himself supports Exeter City so knows terrible football when he sees it!